Molly McClain, PhD, is a native Californian who joined the faculty in 1995. Her academic honors include USD’s distinguished University Professorship and the Davies Award for Faculty Achievement. She writes books and articles in the fields of British and U.S. history, including Ellen Browning Scripps: New Money and American Philanthropy, 1836-1932 (2017), and offers a wide range of undergraduate courses. She is former chair of the Department of History (2004-09) and former director of the Interdisciplinary Humanities Program (2008-16). A graduate of the University of Chicago and Yale University, McClain began her career as a historian of early modern Britain. Her first book, Beaufort: A Duke and His Duchess, 1657-1715 (2001) chronicled the lives of an aristocratic couple who survived the tumultuous decades that followed the English Civil War by creating a remarkable political partnership. Her work on the duchess of Beaufort’s gardens and botanical collections led to an invitation to write “Gardens” for Oxford Bibliographies in Atlantic History (2016). McClain also explored the early life of Queen Mary II, best known for her royal partnership “William & Mary,” in “Love, Friendship, and Power: Queen Mary II’s Letters to Frances Apsley,” The Journal of British Studies (2008). During a research trip to the Netherlands, McClain discovered a remarkable letter written by a French Huguenot which she published as “A Letter from Carolina, 1688: French Huguenots in the New World,” William & Mary Quarterly (2007), with Alessa Ellefson. It was republished in Major Problems in American Colonial History, 3rd ed. (2011). In 2005, McClain began co-editing The Journal of San Diego History for the San Diego History Center. A ninth-generation San Diegan, she felt strongly about the need to encourage writers to explore the region’s fascinating, and understudied, past. As a result, much of McClain’s recent work focuses on the history of Southern California. Other publications in the field of California history include From Jazz Age to Our Age: Architects and Developers of 1920s La Jolla (2017) with Seonaid McArthur and Diane Kane; “Architecture as Nature’s Canvas” in Irving J. Gill: Illustrating New Architecture (2016); “David Lion Gardiner: A Yankee in Gold Rush California” (2016); and “A Room of Their Own: The Contribution of Women to the Panama-California Exposition, 1915” (2015). 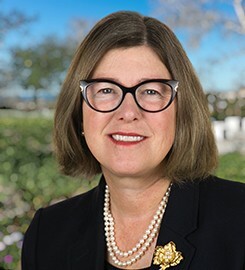 McClain is currently working as a historical consultant for an upcoming exhibit at the La Jolla Historical Society and as a consulting archivist at the San Diego History Center. She also uses role-playing games, part of the award-winning “Reacting to the Past” pedagogy. Games give students agency in the classroom rather than requiring them to remain passive spectators. They also show that ideas—and those who create them—remain vital to the process of historical change. McClain loves to travel and to share her enthusiasm with students. Classes in USD’s study-abroad program include “Art, History, and Culture in Renaissance Italy” (Italy) and “London: Imperial Metropolis” (Great Britain). Submit changes to Molly McClain's profile.